Paperback, 5.5 x 8.5 in. / 104 pgs / illustrated throughout. 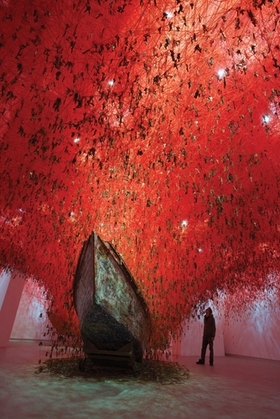 The Berlin-based Japanese artist Chiharu Shiota (born 1972) creates capacious installations that surround the viewer like a mental space. The artist works with her own body and with found objects such as clothing, shoes and dolls; the most striking characteristic of her work is the web of wool threads which connect the space, the objects, the performer and the audience. Text by Tereza de Arruda, Pascal Hess, Olaf Reis. FORMAT: Pbk, 5.5 x 8.5 in. / 104 pgs / illustrated throughout.